Supported by positive manufacturing and service-sector activity, the U.S. economy has settled into a steady pace of economic growth with strengthened hiring trends. 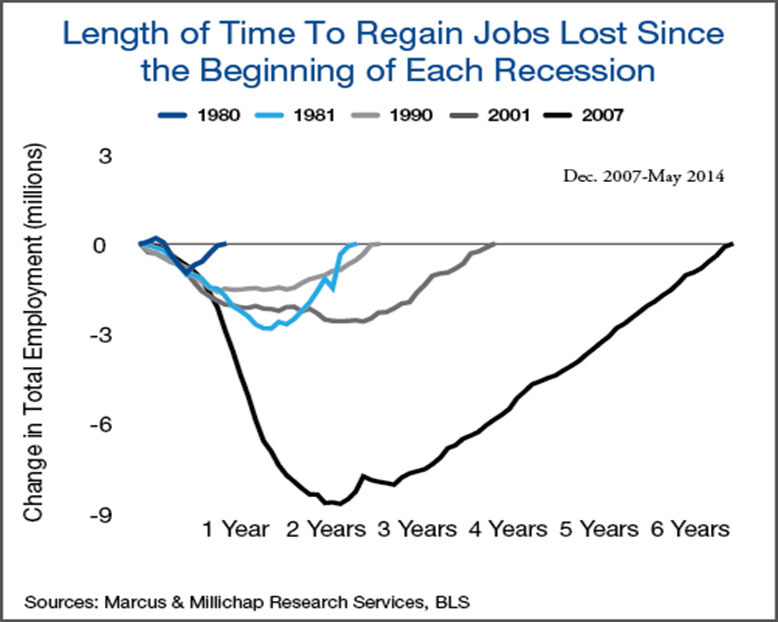 Total employment has passed its pre-recession peak, adding back the 8.7 million jobs lost during the recession. This will be regarded as a positive sign by the Federal Reserve, which will likely continue tapering monthly bond and securities purchases. Interest rates remain low, but the central bank’s public comments and deliberations may increase upward pressure on rates in coming months. U.S. employers added 217,000 jobs in May, as nine of 10 private employment sectors expanded and the government sector contributed 1,000 positions. Professional and business services employment continued to grow in May, while the rising number of people with health insurance lifted healthcare demand and created 54,900 health-services jobs. The trade, transportation and utilities sector also added 39,000 positions last month. Hiring at stores continued, and gains in wholesale trade, and warehouse and transportation payrolls reflect ongoing growth in U.S. imports. Leisure and hospitality employers readied for the peak summer travel season, which unofficially begins on Memorial Day and runs for three months through August, by hiring 39,000 workers last month. Nearly all of the gain was recorded at bars and restaurants, but amusement parks and gambling and recreation establishments also added 3,200 employees. U.S. hotels continue to experience an upswing in room demand and occupancy, but accommodations employment rose by only 2,700 positions in May. The hotel industry is also in the midst of an increase in construction, but new building is concentrated in less labor-intensive lodging brands. Growth in professional and business services and other employment sectors with significant office-using functions are laying the foundation for a quicker pace of recovery in the national office sector. Tenants expanded into an additional 17.6 million square feet of office space in the first quarter this year, trimming vacancy 10 basis points to 15.9 percent. Speculative construction remains minimal, which will contribute to a 120 basis-point drop in vacancy this year to 14.8 percent and support a 3.5 percent gain in the average rent. Recent job growth will generate additional spending at retail establishments over the remainder of 2014, boosting foot traffic at shopping centers around the country. National retail vacancy slipped to 7.1 percent in the first quarter and remains on track to decline to 6.5 percent this year. Retail construction consists of primarily single-tenant concepts and small, heavily pre-leased multi-tenant properties that will not hinder further declines in vacancy. This entry was written by marcusmillichap, posted on June 10, 2014 at 4:45 pm, filed under Research, Uncategorized and tagged Commercial Real Estate, CRE, Employment, research. Bookmark the permalink. Follow any comments here with the RSS feed for this post. Post a comment or leave a trackback: Trackback URL.